Montreal police are reportedly "investigating" Dawson College Massacre!, a Flash game based on the 2006 shooting at Dawson College that left one student dead and 19 injured. On September 13 2006, Kimveer Gill went on a shooting rampage at Montreal's Dawson College, killing 18-year-old student Anastasia Rebecca De Sousa and wounding 19 others before taking his own life after being shot in the arm by police. A Flash game based on that tragedy was released last week and it has quite predictably stirred up strong feelings among students at the school. "I couldn't believe it," nursing student Laura James told the CBC. "I was like honestly shocked, because why would someone do that?" "It can hurt people. If someone just falls upon this site that was actually there they could be reliving something that's like really traumatizing in their life," added fellow student Serina Galle. "No one wants to relive that." One of the sites hosting the game removed it after being asked to do so by the Dawson student union but it's still available on at least three other sites, including Newgrounds, where the game's author wrote, "Most of the dialogue is taken directly from quotes of the shooter! I tried to stay true to the reality of this event. In the event everyone did freeze in a way and let Kimveer take target practice in the cafeteria. Had the police not quickly engaged him he would have killed more. The game is made as such to follow these events and at the same time try to add a little fun, but it's mostly to re-live the experience in a way... have fun." He also said he was sorry if people are "offended in some way" by the game. "Virtuaman," as he's known on Newgrounds, told the CBC that the point of the game is to "draw attention to the reality of school shootings." "I didn't make it to be a sicko or anything. I didn't want to offend the families or any of that, but I guess it's going to," he said. "It's pretty graphic." 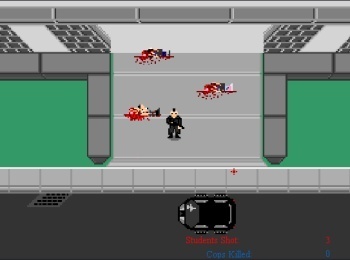 It's not actually graphic at all; it includes images of the shooter that appeared in the press at the time and plenty of pixelated blood, but the gameplay and graphics are about what you'd expect from a simplistic Flash game. Nonetheless, Montreal police are apparently "investigating" the game, although on what grounds is currently unclear. Virtuaman added that he doesn't believe he's broken any laws. Dawson College Massacre! isn't the first videogame to be based on a school shooting. In 2005, Super Columbine Massacre RPG!, based on the 1999 attack on Columbine High School that left 13 dead and 24 injured, was released to an even greater uproar.